One of the gifts my father gave me early on was the encouragement to try new things…and to ask for help when I needed it. He raised bees when he was a child and teenager; and then went back to beekeeping as an adult. Once I moved to the farm, he gave me his beekeeping equipment, hoping to pass along the hobby. I tried it under the guidance of a beekeeper for a year. After getting repeatedly stung in my knee and watching it swell to an unnatural size…I realized that, perhaps, beekeeping is best left to people who REALLY know what they’re doing. After a hiatus from having bees, they have returned to the farm now and are being managed by a professional beekeeper. He knows what he’s doing. He does this in exchange for having about 4 or 5 hives on the back part of the property. We get the honey when the season is done (from our hive). So, the girls and I walked out the other day and looked at the hive (from a distance). The bees were busy flying in and out of the hive. 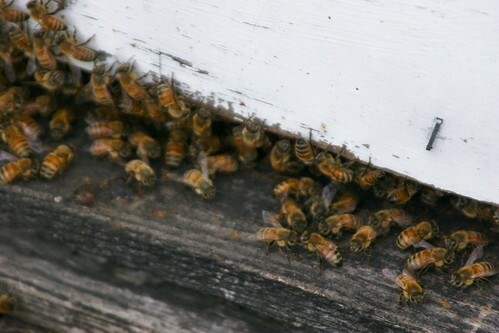 They’re busy and work…and it is fun to have bees again at the farm. In the fall, hopefully the girls will have the opportunity to see the harvesting and processing stages…then they’ll see the full circle (or cycle) of beekeeping. I’m grateful that my dad gave me his equipment…and the encouragement to try new activities and develop new skills. Even though I’m not able to the beekeeping by myself…I have tried many things – new things – in the past year. I can thank my dad for being a great role model and inspiration as I challenge myself in new ways during the next year. Hi Ann, Thank you for adding me as a contact on Flickr! You can follow this back to my blog, Fabric Art & Crafts. I’m interested in your home schooling, as I am a reading tutor!Love your blog!